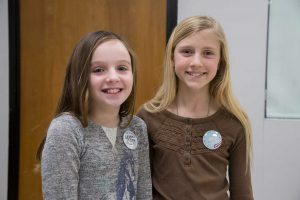 Maryjane Lancer (left) and Elaina Schlesinger, fifth graders at Warwick Valley Middle School, wear their winning button designs. Elaina Schlesinger and Maryjane Lancer, both fifth-graders at Warwick Valley Middle School, are the winners of the school’s recent “No Name-Calling Week” button design contest. The girls’ designs were among dozens submitted by Middle School students as part of the school’s week-long celebration of kindness. Founded in 2004 with Simon & Schuster Children’s Publishing, “No Name-Calling Week” was inspired the James Howe novel “The Misfits” about students who, after experiencing name-calling, run for student council on a No Name-Calling platform. The week is rooted in the idea of “Kindness in Action” and the importance actively adding kindness into interactions with people. In Warwick, the Middle School button design contest invited young artists to submit a design that would be printed on buttons. Maryjane’s “Kindness in Action” and Elaina’s “Blow the Whistle on Bullying!” best expressed the theme, said Middle School Principal Georgianna Diopoulos. The buttons were made – the school has a button making machine – and “sold” to students for the cost of one “ROAR” ticket. ROAR is an acronym for Respect, Outstanding choices, Acceptance, and Responsibility, and students earn ROAR tickets as a reward for good deeds, responsible behavior, and kind actions. Maryjane, who used a film clapboard to illustrate “Kindness in Action!” said her button design was inspired by her love of movies and plays. “I thought about it and tried a couple of ideas before coming up with this one,” said Maryjane. Maryjane’s and Elaina’s winning designs were made into buttons for No Name-Calling Week. Elaina said she enjoys art and hopes that her button reminds her peers to be thoughtful of one another.